Caldwell Cigar Co. was launched in 2014 by Robert Caldwell with a lineup of Dominican blends. The company seemingly came out of nowhere; its cigars debuted only about eight months after Caldwell walked away from Wynwood Cigars, a co-venture with Christian Eiroa, formerly of Camacho. Most people will tell you eight months isn’t nearly enough time to create and execute a vision for a new brand, but Robert Caldwell isn’t most people. 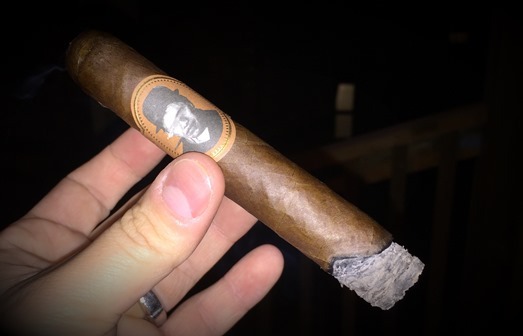 The following year, in 2015, in an effort to reach segments of the market that don’t typically seek Dominican smokes, Caldwell introduced Blind Man’s Bluff. The line is crafted at Agroindustrias Laepe S.A. in Danlí, Honduras—best known as the factory that produces Camacho—using a “their kitchen, our chef” approach. Caldwell says the intention was to make a “Caldwell-eqsue” cigar from tobaccos to which he didn’t previously have access. I smoked a five-pack of the Robusto vitola for this review (the pack was $37.50, or $7.50 per cigar). Beneath the cigar’s interesting and memorable band—which features a black and white portrait of a man in a bowler hat with his eyes smudged out—is a silky wrapper with a few large veins. The Robusto is moderately spongy to the touch with a few soft spots. The pre-light notes at the foot are a combination of earthiness and dried fruit. Once lit, I find a medium-bodied, bready profile of cedar, subtle black pepper, papery airiness, and warm tobacco. The texture is light yet it has a leathery core. Salt hits the tip of the tongue while a soft sweetness adds balance in the background. The pace at which you smoke drastically impacts the intensity of the salt so, if you’re like me and want to limit that flavor, you’ll want to take your time between puffs. Into the midway point, the salt begins to fade while green raisin and hints of vanilla join in. This marks the point at which the Robusto is most enjoyable. The final third is characterized by a slight increase in spice and intensity. I will note, however, that I don’t think this cigar ever ventures beyond medium-bodied. Construction-wise, the burn line leaves something to be desired; touch-ups are needed along the way to keep things on course. The draw is perfect, though, and the smoke production is above average. I would also add the gray, finely layered ash holds well off the foot. As I burned through this five-pack, I realized the Blind Man’s Bluff Robusto is my personal introduction to the Caldwell Cigar Co.—a surprising revelation given how I have appreciated (from an apparent distance) the unique names and interesting artwork associated with the Caldwell brands. I will be actively seeking out other Caldwell blends to see how they suit my palate. But this Robusto, while certainly not bad, doesn’t seem to deliver much of what I’m looking for. I find it somewhat dry and not as flavorful as I had hoped. For me, it rates a respectable though uninspired three stogies out of five.